On 19th April 1995 at just after 9a.m, when parents had dropped their children off at the day care centre at the Alfred P. Murrah Federal Building in Oklahoma City in the USA, the inconceivable happened. The blast also damaged 324 buildings in a sixteen-block radius and destroyed 86 cars around the site. There were scenes of chaos as paramedics treated the wounded on the pavement and rescue workers battled to dig out those still trapped in the rubble. 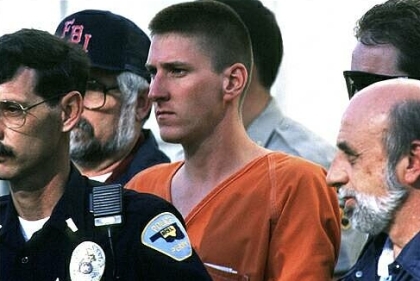 On 21st April, the massive manhunt for suspects in what was the worst terrorist attack ever committed on U.S. soil until September 11th 2001, resulted in the capture of Timothy McVeigh, a 27-year-old former U.S. Army soldier who matched an eyewitness description of a man seen at the scene of the crime. On the same day Terry Nichols, an associate of McVeigh’s, surrendered at Herington, Kansas, after learning that the police were looking for him. Both men were found to be members of a radical right-wing group based in Michigan, and on 8th August another associate John Fortier, who knew of McVeigh’s plan to bomb the federal building, agreed to testify against McVeigh and Nichols in exchange for a reduced sentence. Two days later, a grand jury indicted McVeigh and Nichols on murder and conspiracy charges. It emerged that the August 1992 shoot-out between federal agents and survivalist Randy Weaver at his cabin in Idaho, in which Weaver’s wife and son were killed, followed by the 19th April 1993, inferno near Waco, Texas, that killed some 80 Branch Davidians, deeply radicalised McVeigh, Nichols, and their associates. 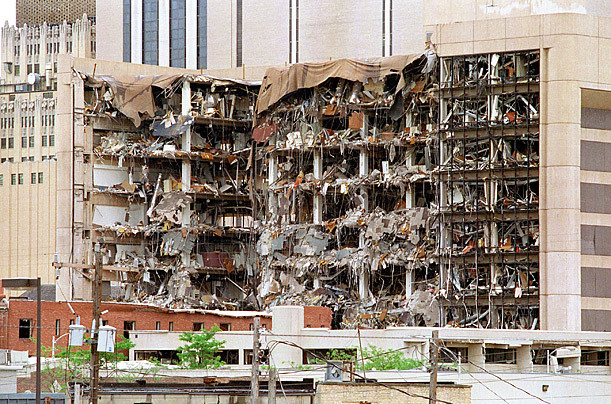 In early 1995, Nichols and McVeigh selected the federal building in Oklahoma City as a target because it housed, among other federal agencies, the Bureau of Alcohol, Tobacco and Firearms (ATF), the agency that had launched the initial raid on the Branch Davidian compound in 1993. So on 19th April 1995, the second anniversary of the end to the Waco standoff, McVeigh and Nichols loaded 108 22kg bags of ammonium nitrate fertiliser, three 208l drums of liquid nitromethane, several crates of explosive Tovex sausage, seventeen bags of ANFO, and spools of shock tube and cannon fuse into the yellow Ryder Rental truck. McVeigh then added a dual-fuse ignition system that he could access through the truck’s front cab. McVeigh also included more explosives on the driver’s side of the cargo bay, which he could ignite with a Glock pistol if the primary fuses failed. After finishing the construction of the truck-bomb, the two men separated. Nichols returned to Herington, Kansas; McVeigh drove the truck to Oklahoma City. Minutes later, the massive bomb exploded, killing 168 people. At least 24 eyewitnesses later said they saw McVeigh with one or more accomplices in Oklahoma City on the morning of the attack, but no one was ever identified. It was not Terry Nichols, the known accomplice of Tim McVeigh. He was at home in Kansas over 200 miles away on that day. On 2nd June 1997, McVeigh was convicted on 15 counts of murder and conspiracy, and on 14th August, under the unanimous recommendation of the jury, was sentenced to die by lethal injection. The associate of McVeigh and Nichols, Michael Fortier was sentenced to 12 years in prison and fined 200,000 USD for failing to warn authorities about McVeigh’s bombing plans. Terry Nichols was found guilty on one count of conspiracy and eight counts of involuntary manslaughter, and was sentenced to life in prison without parole. In December 2000, McVeigh asked a federal judge to stop all appeals of his convictions and to set a date for his execution. The judge granted the request. On 11th June 2001, McVeigh was executed by lethal injection at the U.S. penitentiary in Terre Haute, Indiana.